I have a student who, upon hearing that I would be in Kyushu on an adventure, was adamant about me visiting the top ramen shop in her hometown. So adamant that she printed out directions! 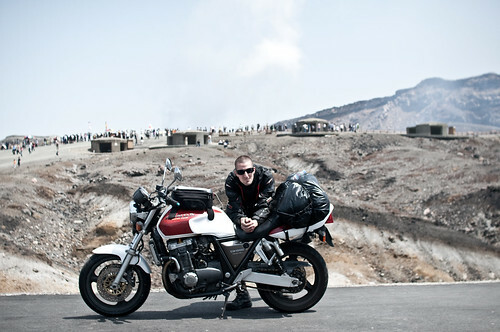 Luckily, Kumamoto is very near Mount Aso, the active volcano that I had plans to ride my motorcycle around. So after the tourism was done, the eating could commence. Komurasaki is by far the most famous shop in the Kumamoto ramen circle. If you don't want to travel all the way to sunny Kyushu, you can have some (for now) at the Yokohama Raumen Museum. The tell tale sign of Kumamoto style ramen is the addition of lots and lots of garlic, usually in the fried chip form. Being Kyushu, the soup is a milky white tonkotsu. Pork bones are simmered for a day in the central kitchen, then taken to the branch shops in empty gas cans. Nice city, I wish I had had time to spend a night there. But it wasn't to be. Next stop... Hakata!